We have been waiting for this day for a while now so it comes as no surprise that T-Mobile has officially unveiled the Sidekick 3. Everything was spoiled by the early image and specs leaks. As you probably know already, the Sidekick 3 will feature a 240x160 pixel, 65k color display, 1.3 megapixel digital camera with LED flash, trackball, Bluetooth 1.2, music player, miniSD card slot for up to 2GB of memory and EDGE. 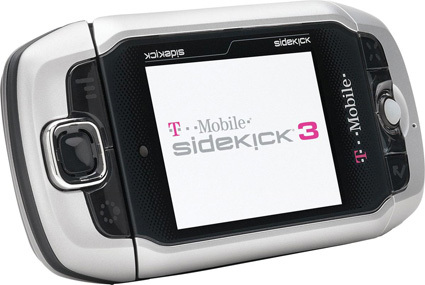 If you're currently a T-Mobile customer, you will be able to purchase the Sidekick 3 starting June 28. If not, you will have to wait a little longer, until July 10. The price of the Sidekick 3 will be $299.99 with a 2-year contract and $349.99 with a 1-year contract. Woo-hoo! So I'll get it faster? That's great. Oh man my friends are going to be sooo jelous. They told me that I was crazy when I started saving for this baby. My Sidekick II is still working great and I'm very pleased with it ... I hope the Sidekick 3 will do the same. hey, i'm interested in the sidekick but I'm affraid that it wouldnt work where i come from (Malta-Europe). I know that if i buy one unlocked i can use it with a vodafone sim card but will all the features work? No, I don't think the sk3 data system will work on that network. The gprs network is almost a completely separate subsystem compared to the standard phone service. so if the phone is unlocked then does that mean you can put a sim card in it and it will work? i need details on this, i dont get it! will side kick 3 work in malta if its unlocked ??? . if i but a sidekick 3 will it work in malta with my go mobile sim card and will i still be able to have the same features that t-mobile offers and do i need to do a contract or anything? i live in Malta.. will it work? i live in malta too and have the same questions, most importantly if its unlocked will it work with a vodafone sim card? and should i but it unlocked, or can i get it unlocked in malta after ive bought it?